The New Orleans Bowl will be one of the first college bowl games played in 2010. The Ohio Bobcats will take on the Troy Trojans in the Superdome on Dec. 18 at 9 p.m. EST. Both of these teams struggled through portions of this season, but they were able to keep it together and get back to another bowl game. This looks like an even matchup, so it should be a good way to kick off the bowl season. The Ohio Bobcats haven’t had much of a passing game this year, but they have been solid on the ground. Boo Jackson and Phillip Bates have shared time as the starting quarterback for the Bobcats, but I expect Jackson to see most of the time in what will be the final game of his career. Jackson is a decent passer, but he throws far too many interceptions. He threw 15 touchdown passes and 16 interceptions during the regular season. When Bates is in the game, the team is usually running the football. Vince Davidson is the primary tailback for the Bobcats. The Troy Trojans are led by quarterback Corey Robinson. Robinson threw for 3,339 yards during the regular season. Troy averages an impressive 289 yards per game through the air. The Trojans have plenty of depth at the skill positions. Shawn Southward is the leading rusher, but DeJuan Harris and Chris Anderson see plenty of carries as well. Wide receiver Jerrel Jernigan is the team’s best play maker, and he caught 77 passes this year. The Trojans have eight players that registered at least 14 receptions. Troy’s offense has been able to move the ball well in almost every game this year, but turnovers have held them back in some games. The Ohio Bobcats lost linebacker Noah Keller, their defensive leader, to injury early in the season. They struggled for the first few games without him, but they really came into their own down the stretch. 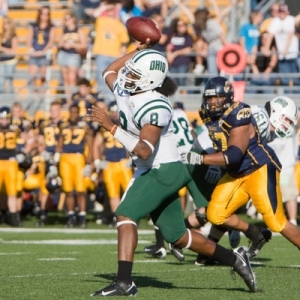 The Bobcats allowed only 99 yards per game on the ground this year, which was good for sixth best in the nation. The strength of this defense is up front, and this defensive line usually controls the battle in the trenches. Ohio is allowing 21.8 points per game this year. The Troy defense has struggled mightily this year. The Trojans are allowing a staggering 31 points per game this season. Troy’s defense brings the heat often, and they have racked up 34 sacks so far this year. Since they send so much pressure, the cornerbacks are often left with little help from the safeties, and this team has been beat deep quite often. Power rushing teams have been able to run the ball on this unit as well. The defense must step up if Troy is going to win this game. The Ohio Bobcats opened as a one point favorite, according to college football odds, but the line has steadily moved in Troy’s favor. Troy is now a slight 1.5-point favorite in this game. The posted total opened at 58 points and has not budged at all. The Bobcats are 7-1 ATS in their last eight games as an underdog. Troy is just 2-5 ATS in their last seven games overall. The ‘over’ is 7-1 in Ohio’s last eight games as an underdog. The ‘over’ is 4-0 in Troy’s last four bowl games. Troy should have a bit of a home field advantage here, but their defense is just plain terrible this year. Ohio’s defense hasn’t faced many good passing games this season, and I expect them to struggle to stop Troy. I think ‘over’ 58 is the best play in this year’s New Orleans Bowl. Vegas Sports Informer is one of the strongest college football handicappers out of Sin City and he has utilized his Las Vegas contacts and has found many weaknesses in the college bowl game lines. He will have football picks for all 35 bowl games and he expects to hit better than 60% of these games, so getting on his college football package is a great holiday investment.